The Dwarf Colorado Spruce Tree is a specially-grown tree that we have had produced just for our Gift Tree section, because we know what a great gift this novel and beautiful tree is. Maybe you want to welcome someone to their new home. Maybe you want to mark a special occasion, like a birthday or birth. Whatever the occasion, or if you are just in a giving mood, this beautiful and hardy miniature tree makes the perfect tree for any garden, from the smallest balcony to the largest estate. 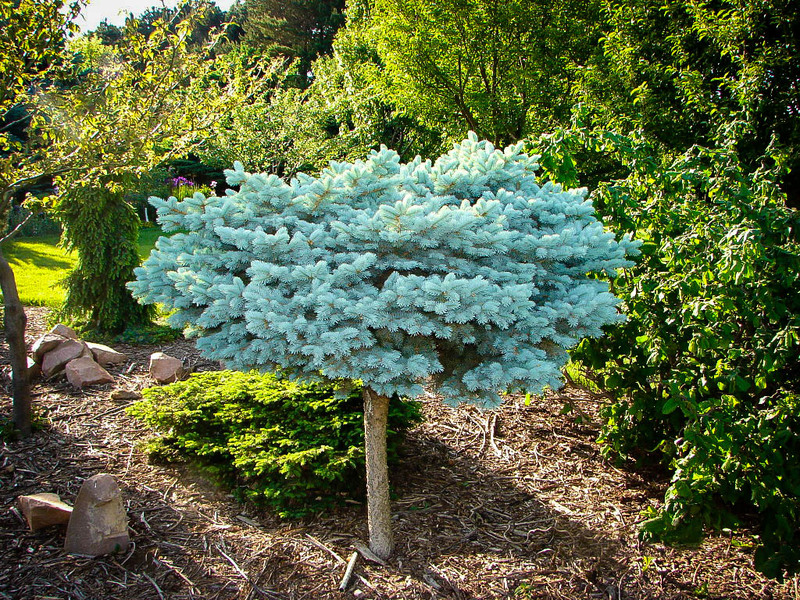 It’s unique form, a rounded, silver-blue globe of evergreen foliage on a sturdy trunk, give special character to this tree and will be loved by every gardener. 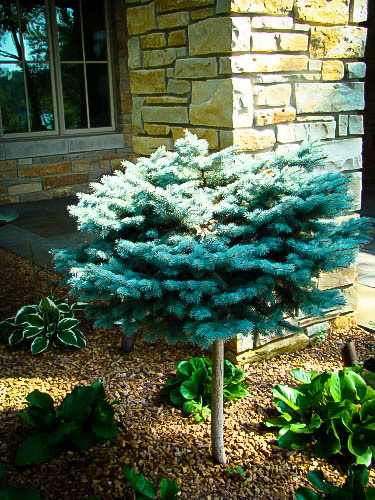 Wherever the garden, no matter how cold, the Dwarf Colorado Blue Spruce Tree will thrive – this tree is hardy to minus 50, so not matter what the weather does, it will come through. It is also ignored by deer and rabbits and has no significant pests, so it is an easy-care tree that needs nothing beyond a little water when it is freshly planted. Once established it is also drought-resistant and thrives in all soils. Its brilliant silver-blue needles will lighten up the garden all year round, always looking fresh and bright at every season. If you are looking for the perfect gift tree, this could be it. 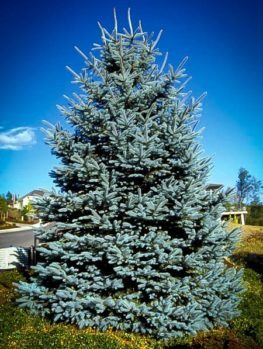 The Colorado Blue Spruce is an iconic tree; both when growing wild in the Rockies and when growing in gardens of cool to cold regions. 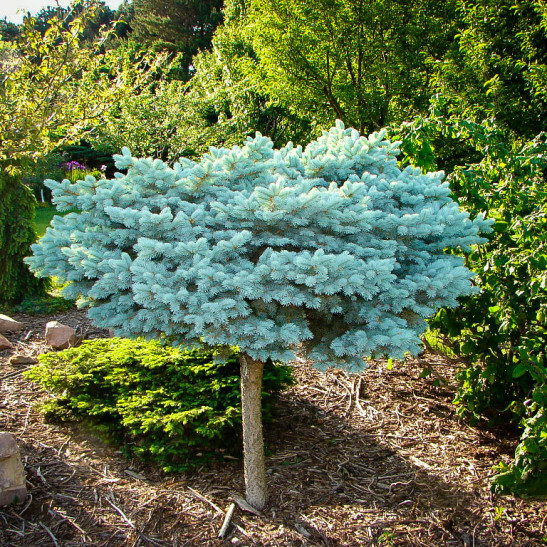 It is a splendid tree with striking silver-blue foliage and majestic form. Not all gardens are big enough for one, and yet all gardeners deserve the chance to have that beauty in their garden – so at the Tree Center we have found a solution to this dilemma. We have had a dwarf form of the Colorado spruce attached to a sturdy trunk, to produce a great little tree that can even be grown in a pot. This is also one of the most ideal trees to give as a gift, since it can be grown in any region and in any garden. Even if the person you send it to doesn’t have a garden, it can be grown on a terrace, a patio or even on a balcony. 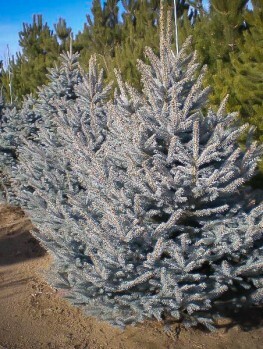 So for the perfect gift, the Dwarf Colorado Spruce Tree is the perfect choice. 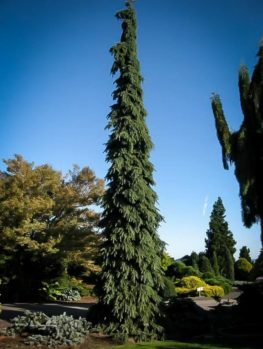 Such as special tree can only be grown the way we have described, so avoid any seedling trees, or other kinds of spruce, which certainly will not be the amazing Dwarf Colorado Blue Spruce Tree, a unique and special gift that will be a big hit whoever you gift it to – and wherever it is grown. To create this tree, we started with a dwarf form of the Colorado Spruce. This grand forest tree grows throughout the Rocky Mountains, mostly at high altitudes, so it is remarkable hardy, surviving in temperatures as low as minus 50 Fahrenheit. 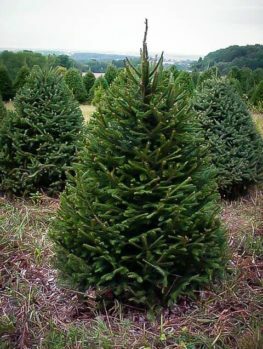 The sturdy needles of this evergreen radiate around the stems and the tree has a beautiful symmetrical and narrow pyramidal form. 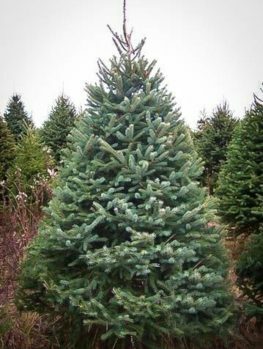 In its natural state it is a great windbreak and specimen tree, especially in cold areas. 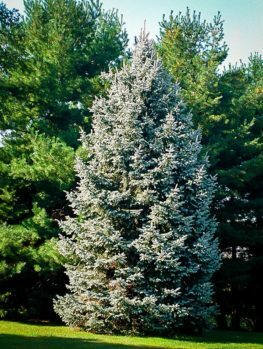 In nature the needles vary in color, from green to silver blue, and over the years gardeners have collected forms with stronger and stronger color, to emphasis the beauty of the bold silver-blue needles that makes this tree such a striking feature in the garden. 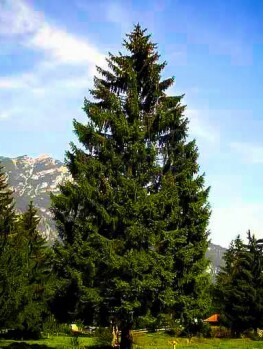 Sometimes plants do not grow to full size, but remain small and one of the very best of these dwarf forms is the Dwarf Colorado Spruce. 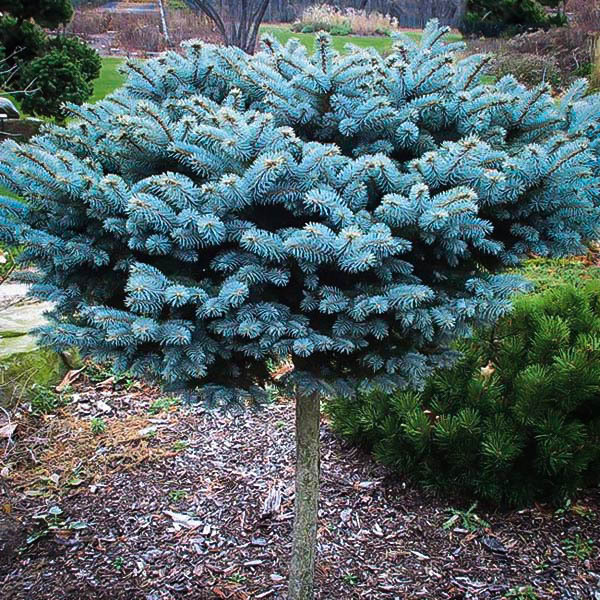 Left to grow naturally this tree, with its strongly colored blue needles, will form a rounded evergreen bush, three to five feet tall and wider than it is tall, spreading to around six feet in time. At all times of year this is a stand-out specimen in any garden. We asked our skilled growers to attach selected pieces, taken from the best plants, to sturdy trunks grown from full-sized trees. These plants form a very attractive rounded globe on a stem, reaching five feet tall quite quickly and making a great garden feature and a wonderful gift for someone developing their garden. This beautiful and bold plant can be place around the house, as a feature in a bed, or grown in a large pot on a terrace, patio or balcony. It will have a large ball of foliage on top of its strong stem, never growing too large and interfering with other plants around it. 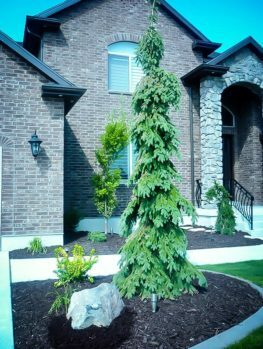 Choose a sunny spot for your Dwarf Colorado Spruce Tree, although it will also grow well if it is in shade for part of the day. It will grow in almost any kind of soil, from sand to clay, as long as it is not constantly wet. During the first season give the tree some water at least each week, but once established this tree is very drought resistant, so there is no need for much attention at all – a real low-maintenance plant. It can be left to grow naturally, and it will form a lovely broad sphere of brilliant silver-blue in the garden, or a light trimming will keep a perfect globe form, if that is what you wish. Not only is this tree not affected by the coldest weather, it is also ignored by deer and rabbits, resists air pollution and grows almost anywhere. It also has no significant pests or diseases, so you can be sure that your gift tree is not going to be a nuisance and create work for the receiver – just become a great garden feature and an enduring memory of your gift.